As Brewsvegas was coming to an end I realised I had been rather absent from the festivities. 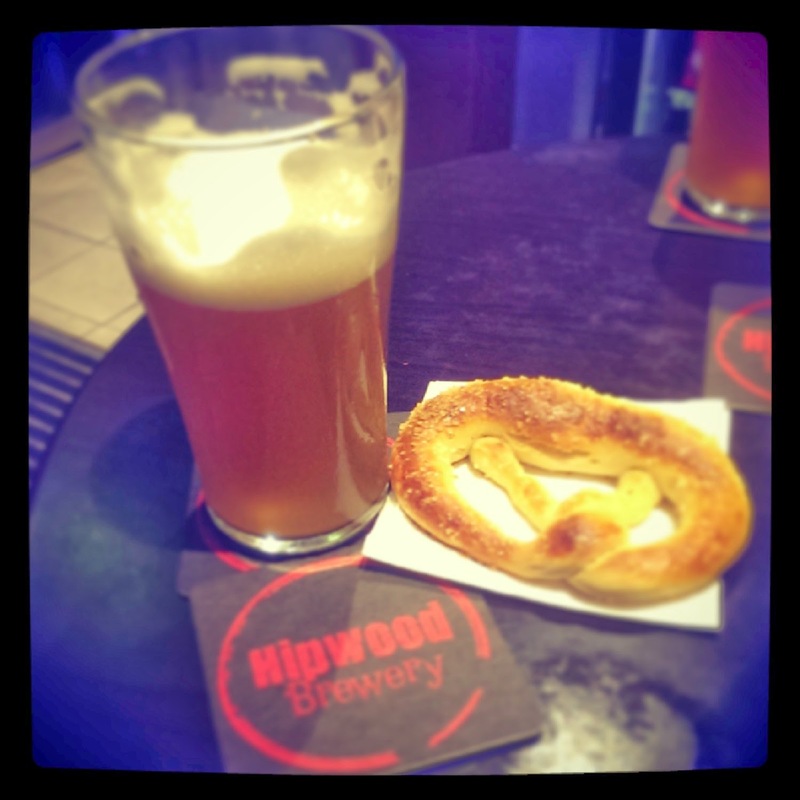 I made plans with a couple of mates to head to the International Hotel's Hipwood brewery launch so that I could at least have attended an event over Brewsvegas and to check out what was in store with the re-launch of the hotels internal Brewery. I have visited International Hotel a few times for lunch and some very cheap ($5.50/pint) and half decent craft beer and do enjoy the local pub atmosphere on occasion so it made sense to head there for a few brews after work on Friday and see what the Hipwood re-brand was all about! Hopping on the Spring Hill loop meant we were at the hotel in no time, greeted by a pretty decent looking turn out of locals and beer lovers we found a spare table and settled in. I started off by ordering a pint of the Hills Hefe which flavourful and true to the Hefeweizen style pairing off well with the free pretzel we were offered to snack on, however it seems the price of beers have gone up with the launch to around $8/pint which is still cheap compared to other places but not nearly as much as it used to be! As the launch started to ramp up we were offered more free (and delicious!) food with mini pork sliders, mini hot dogs and beer nuts which were all quite delicious. I headed back to the bar and ordered a couple of tasting paddles(for me and a friend) to get a better idea of the rest of their beers. 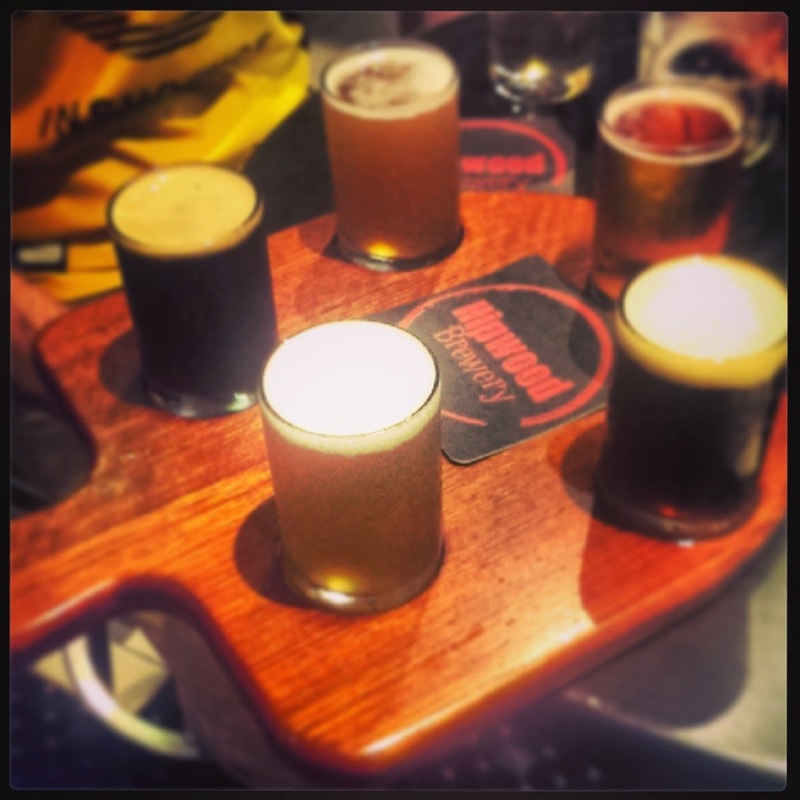 It was a pretty impressive looking paddle and decently priced at $12 with a taste of the 5 beers on offer. The beers were Hills Hefe, Jimmy's Pils, Midnight Porter, Poley Oley (Pale Ale) and Red Eye (Red Ale). My favourite was the Pale Ale and although I find the name a bit odd I didn't find the beer anything but delicious with a real big citrus punch and good hop flavour, by far the stand out here and worth having a session of. 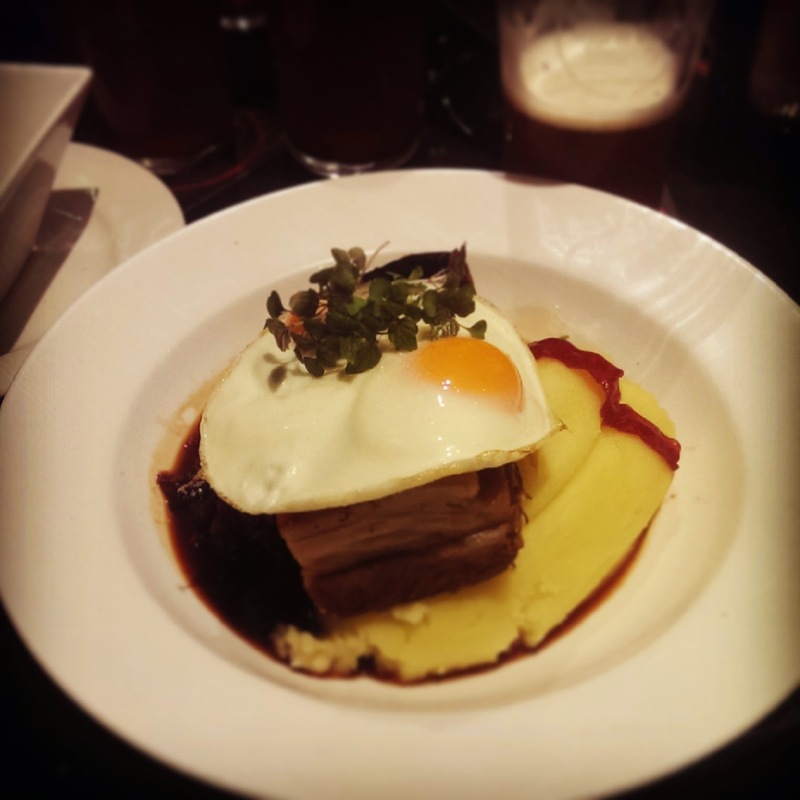 After finishing off my paddle of beers I ordered a meal in the form of "Bacon and Eggs Pork Belly" which was an interesting combo of pork belly, mashed potato, saurkraut style red cabbage and 2 fried eggs. It was rather tasty and had definite German food influences which match the Hipwood beers really well however I would have liked the belly to be rendered a bit more, it had some crunch but was missing that "crackling" feeling you expect. I really like what International Hotel is trying to do with changing their "local" hotel image into a good time, good food gastro pub with in house craft beer. I think it is ambitious but also very doable if they keep working at the beers and the food and promoting themselves. I absolutely wish them all the best in this and will no doubt visit again sometime in the near future.